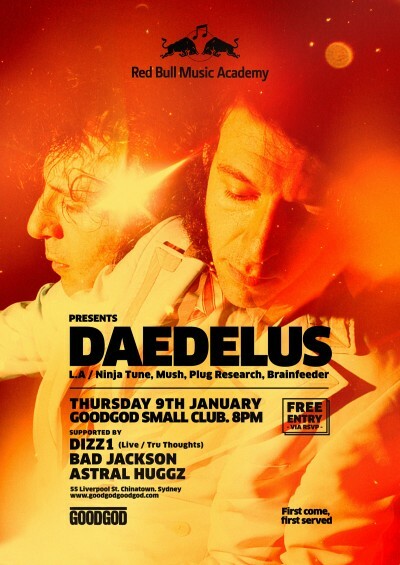 Red Bull Music Academy (RBMA) is kicking 2014 off with one hell of a party – achingly cool, LA-based, veteran producer Daedelus will be hitting the danceteria on Thursday the 9th of Januaray. As part of our free RBMA monthly Club Night series, Daedelus (AKA Alfred Darlington) will bring his genre-mashing music inventions to the stage to create a musical universe that is far from vanilla. Delivering his latest offering Drown Out, the Californian beatsmith is touching down on Aussie soil for the first time in more than two years. Entertaining punters with his ever-evolving brand of beats, Daedelus will prove that hip-hop, rave and classical flavours, laced with progressive samples and electronic beats can seamlessly work together. On support duties will be RBMA alumni, turntable master and producer Dizz1, along with local Sydney producer making some serious noise Meare. DJ duties will be split between the always on point Bad Jackson and Astral Huggz who together will serve up some of the finest forward thinking jams. Best part is FREE entry as always – click here to RSVP! NOTE: Entry is subject to capacity. Get a taste of some daedelus vibes with his killer boiler room set below.